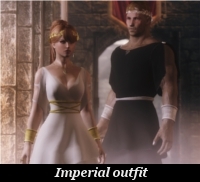 This mod add the Imperial outfit to Skyrim, an outfit inspired in ancient Rome clothing. 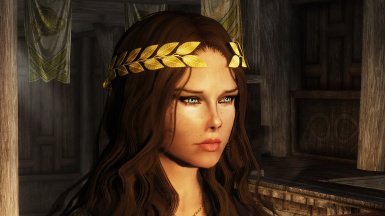 The outfit comes in two versions, short and long, and it also has some complements: sleeves, belt, sandals, short sandals, bracelets and laurel crown. 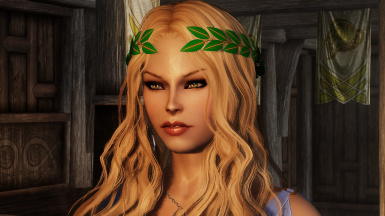 Thanks to Dimon for the original UNP female body. Thanks to Chris57 and Sundracon for the male body. Thanks to Phygit for the female feet. 06-07-2014 - Uploaded a replacer for the Party outfit at the Embassy. 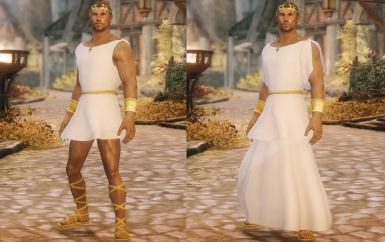 08-07-2014 - Uploaded a replacer for the Wedding dress. 05-07-2014 - Added the male version of the clothes. 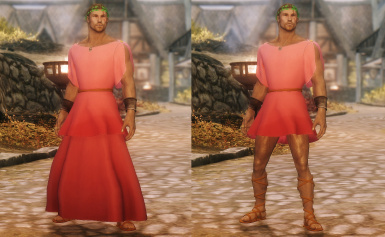 11-07-2014 - Uploaded a replacer for Jarl Elisif's clothes. If you see the vanilla clothes on Elisif, open the console, click on her (make sure you've selected her, not the throne or another NPC) and type "resetinventory" (without commas). 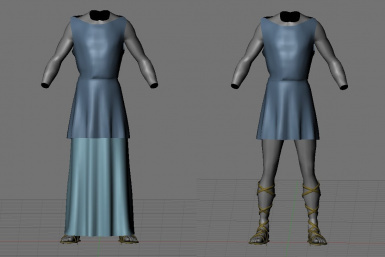 11-03-2014 - Fixed the material for the sandals. Now they can be crafted under the Imperial section as intended. 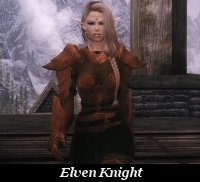 12-04-2014 - Added the beautiful retextures done by Elaneith under the optional files section. 09-03-2014 - Added patch for the Seven Base body made by Nemmitron. 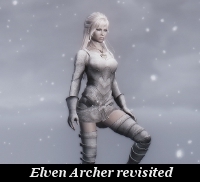 ** Translation by Zaxxon007 on Nexus: http://www.nexusmods.com/skyrim/mods/84432/? The long outfit, short outfit and sleeves have four available colours: white, black, red and blue. The belt, sandals and short sandals are available in golden, silver and brown colours. The bracelets come in golden, silver and iron colours. 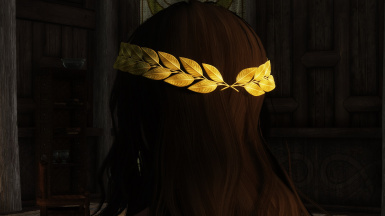 The laurel crown comes in golden, silver and "natural" (i.e. green and brown) colours. All items can be forged at the tanning rack under the Imperial section, and are fully enchantable. 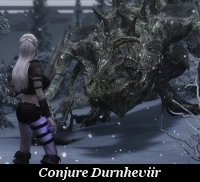 The male bodies used for the armour are the The male bodies used for the armour are the Sundracon bodies (http://skyrim.nexusmods.com/mods/2488//?). Theres is also a patch under optional files, made by Nemmitron, that converts the meshes to the SevenBase body. 3. 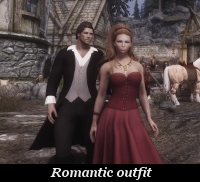 Open the Skyrim launcher and in "Data files" check the AsharaImperialOutfit.esp. Make sure that the esp is loaded after Skyrim.esm and Update.esm and that both are active. 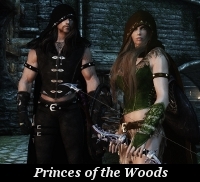 As this replaces the party outfit it will be incompatible with any other mod that modifies/replaces those outfits. If you find anything else, please tell me. 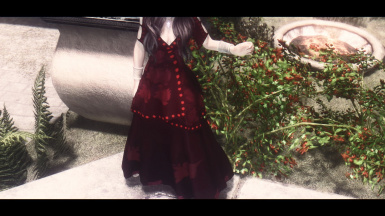 As this replaces the wedding dress it will be incompatible with any other mod that modifies/replaces those outfits. If you find anything else, please tell me. 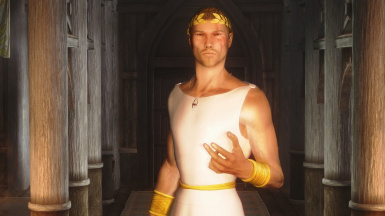 As this replaces Jarl Elisif's clothes it will be incompatible with any other mod that modifies/replaces those outfits. 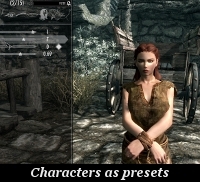 It is completely compatible with mods that only change her appearance or statistics, as this replaces doesn't touch the NPC. If you find anything else, please tell me. 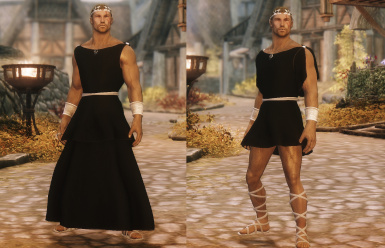 There is some clipping in some poses, mostly with the long skirt and the sleeves. If you see the vanilla clothes on Elisif, open the console, click on her (make sure you've selected her, not the throne or another NPC) and type "resetinventory" (without commas). * Foaman's UNP Clothing Merchants. 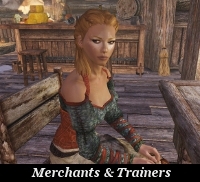 The items of this mod are added to a merchant named Victoria. * jacknifelee's Age Of Empire. 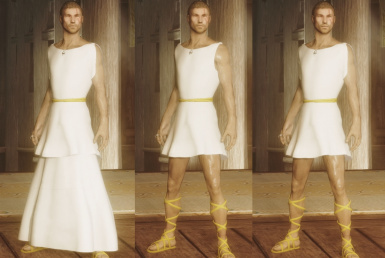 A beautiful retexture of the clothes here, inspired by costumes from SPARTACUS: BLOOD & SAND TV-show. * Aisaka's Byrgith and Rannweig - dragon priestesses followers. 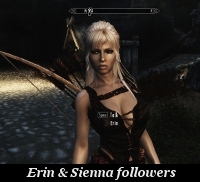 These followers use the sandals from this mod. 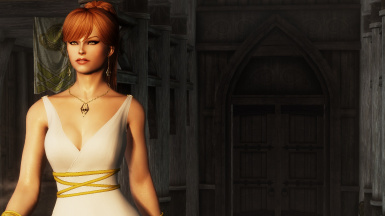 * Rivergenesis' Adia Star's Imperial Goddess.A beautiful retexture of the clothes here. 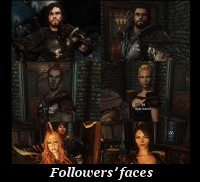 * okame28's OK_Custom Voice Followers and the SSE version OK_Custom Voice Followers_SE. 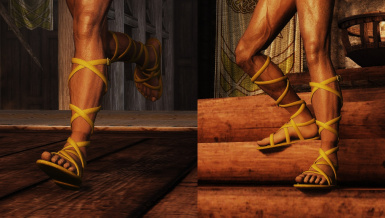 These followers use the sandals from this mod. * livtempleton's Mashup Tribe Dresses UNP. 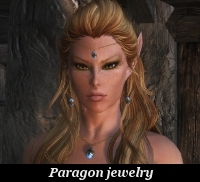 A great mashup collection that uses some items from this mod. 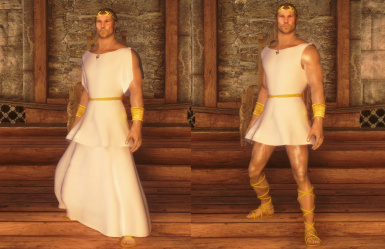 2.0, 08-07-2014 - Uploaded a replacer for the Wedding dress. NMM will guide you through the installation process. 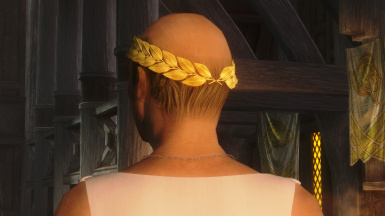 2.0, 06-07-2014 - Uploaded a replacer for the Party outfit at the Embassy. NMM will guide you through the installation process. 2.0, 05-07-2014 - Added the male version of the clothes. 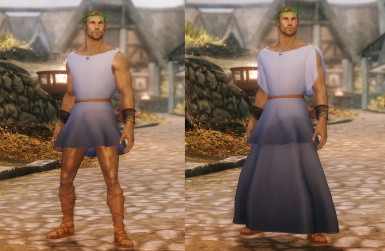 1.1, 12-04-2014 - Added the beautiful retextures done by Elaneith under the optional files section. 1.1, 11-03-2014 - Fixed the material for the sandals. Now they can be crafted under the Imperial section as intended. 1.0, 09-03-2014 - Added patch for the Seven Base body made by Nemmitron. 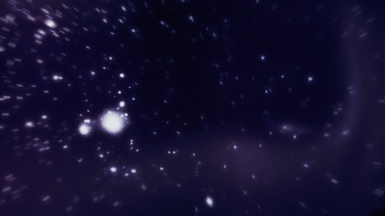 1.0, 02-03-2014 - Initial release. You can contact me leaving a comment at the mod's thread or sending me a PM.